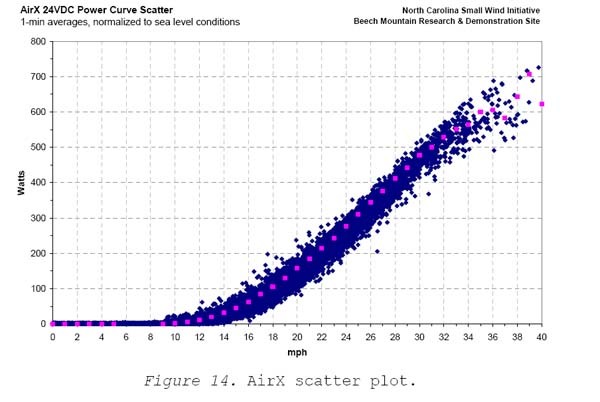 Tests on the Air X at Applachian State University's Beech Mountain Small Wind Research and Demonstration Facility by Brent Summerville differ inexplicably with power curve tests on the Air X at the Wulf Test Field. Unlike the measurements at the Wulf Test Field, there is surprisingly little scatter in the data from the Air X at ASU. Moreover, when corrected for sea level conditions, the ASU data show the Air X as meeting its power rating of 400 W. This is more than twice that measured at the Wulf Field. For the full report by Brent Summerville see Small Wind Turbine Performance in Western NC .